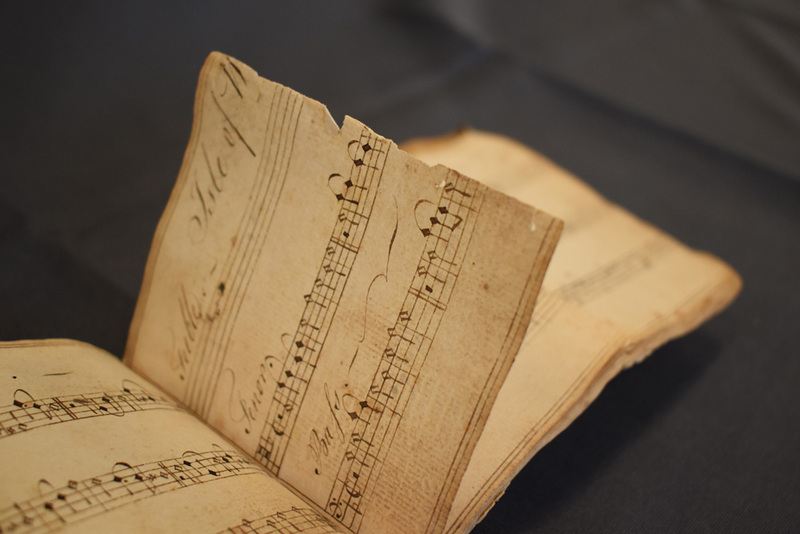 Earlier this year, two music manuscripts arrived in the book conservation lab from the Dibner Library for the History of Science and Technology. 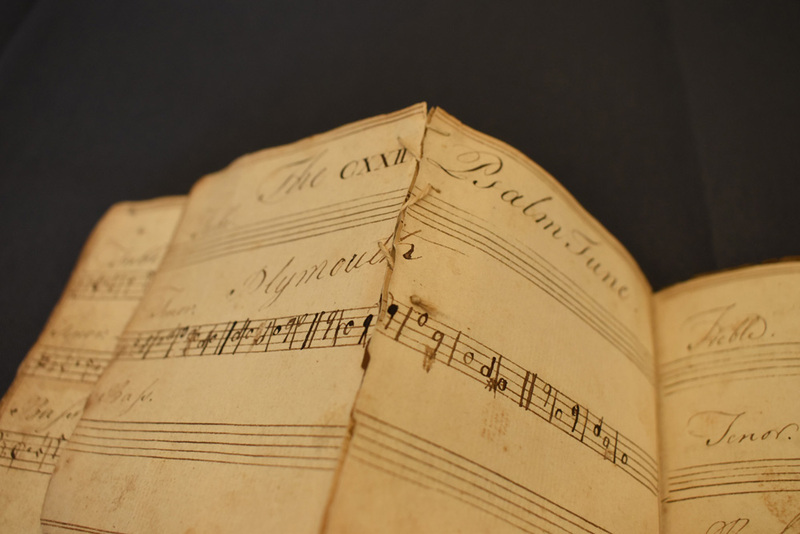 These two small items, James Bishop’s musical Gamut of 1766, and Uri Bishop’s Military Music from the War of 1812, were part of a donation earlier in the year by James L. Cerruti and his sister Vera V. Magruder. 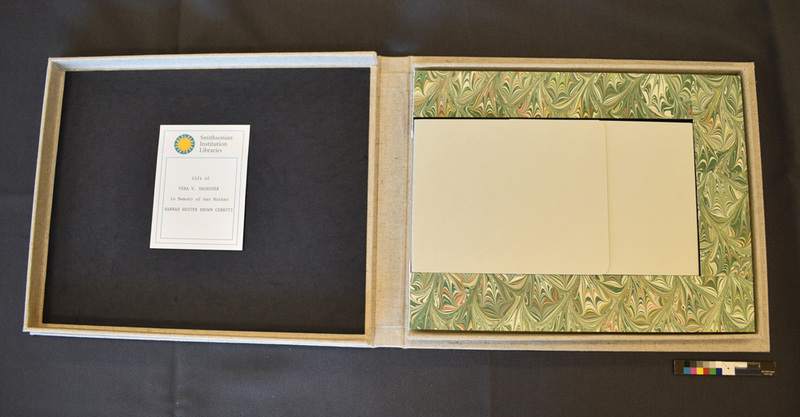 The generous gift was featured in a Smithsonian Libraries blog post by Liz O’Brien, “Donations Reveal a Family History”. 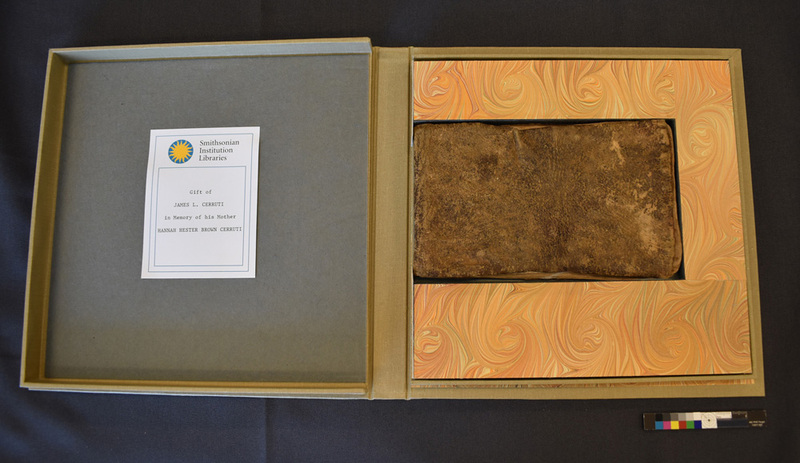 The small manuscripts in single-section pamphlet-style bindings showed wear that revealed an interesting past. Uri Bishops’s book of music included an inscription from about the turn of the last century, indicating that the book was used by Mr. Bishop, who was a young fifer in the War of 1812. The edges of the pages were worn, folded, and torn. The textblock of James Bishop’s 1766 booklet ( a leather-bound manuscript containing music scales, musical characters, and lessons for tuning the voice) had been creased vertically, possibly having been carried in a pocket, which resulted in weakness and tearing along the folds of each page. At some point, someone lovingly repaired the pages with a needle and thread in order not to lose the disassociated sections of the paper. In this case, I removed these threads and chose to repair the tears using Japanese paper mends. However, iron gall ink appeared to have been used throughout the manuscript. Iron sulfate was often included in recipes for this ink and when used in excess, this ingredient creates a high concentration of iron ions in the paper support. Free ions accelerate the oxidative breakdown of cellulose. There have been various methods tested for approaching iron gall ink treatment – and for this, the broken sections of pages were joined using a prepared a dry, remoistenable methyl cellulose tissue. This provided the introduction of minimal amount of moisture and a relatively flexible adhesive. Once the repairs were completed, separate protective enclosures were constructed for both items, ensuring safe handling and storage. Previous Post It’s Your Deal. Five Card Stud, or… Whist?